Dragon Warrior (Dragon Quest in the rest of the world) is an RPG released by Churnsoft and published by Nintendo for the Nintendo Entertainment System (NES) in 1989. It was one of the first RPGs released on the NES and was mostly likely the first RPG played by many people of that era because the Nintendo Power magazine gave it away with a subscription. The game plays like an old school RPG because that's what it is. you travel overland with an overhead view between locations with enemies popping up at random to attack you. You need to do some grinding to level up before you can tackle the next village. You'll go from one village to the next talking to everyone you meet hoping to gain one piece of information on what you need to do next. The story of Dragon Warrior (decades old spoilers!!) is that the evil Dragonlord attacked Tantegel Castle with his dragons and stole the Ball Of Light. Since then enemies have been seen everywhere attacking travelers. King Lorik of Tantegel Castle asks you to defeat the Dragonlord because you are the descendant of Edrick. Many years before the land was shrouded in darkness but Edrick defeated an evil enemy and restored light back to the world with the Ball Of Light. You, playing as Edrick's descendant, must find his old weapons and armor, including the Ball Of Light, before you can defeat the Dragonlord. Once you find everything you must face the Dragonlord. Before the battle begins the Dragonlord gives you a choice to join him. If you choose to join him you fall asleep and the game freezes. Then if you're real unlucky the NES wipes out the saved game you're playing and possibly all the saves on your cartridge. Can you just imagine how people must have complained about that back then and how they would complain today if that happened to them. At least today you could have found out about it on the Internet but back then you wouldn't have known what had happened and just thought your game was broken. 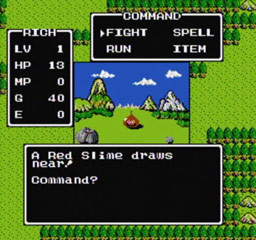 The game was called Dragon Quest in the rest of the world because of a paper and pen RPG in America called Dragon Quest. It was released in Japan on the Famicom, the Japanese name for the Nintendo, in 1986. The game was changed for American audiences in a few ways. Besides the name change, there were some graphical and name changes for the American release. A big change was changing the way the NPCs in the game talked. In the American version everyone talked in Ye Olde English. The biggest change was the addition of the battery backup save. It allowed you to save your game without having to enter a large password which if you remember those types of saves were just terrible. Half the time they used both 0 and O, 1 and I were confusing never mind if you lost the password, that type of password system was just terrible. When you signed up for Nintendo Power in the late 80's they would send you a copy of Dragon Warrior. It also came with some aids to help play the game, Nintendo Of America didn't think Americans could handle the game without help. The Explorer's Handbook told you how to beat the game step by step. The game also came with a laminated card that tells you how much XP you need to level up as well as what you get with each new level. Apparently Nintendo Of America, after seeing how well the game sold in Japan, produced too many games than there was a demand for. Nintendo panicked and started the Nintendo Power promotion to get rid of the extra games that were unsold which helped boost the magazines sales. Overall I still think it's one of the best RPGs I've ever played. A lot of people think Final Fantasy, which came out about a year after, was better. 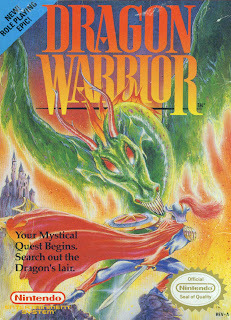 It fixed a few of the issues people had with Dragon Warrior but I'll take Dragon Warrior any day. The only game I like more for the NES was Super Mario Bros. Dragon Warrior was the game that started my love for RPGs. I've beaten it a handful of times and I'm playing through it again right now. Dragon Warrior for NES, 10 out of 10! !